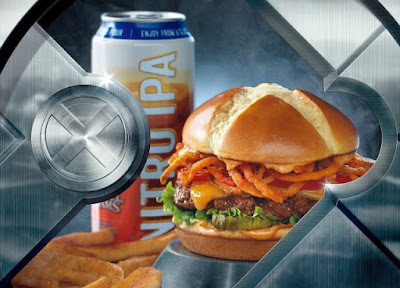 Red Robin's Wolverine-themed Berserker burger gets new life as the Berserker X burger in a tie-in with the upcoming X-Men: Apocalypse movie. Available through June 5, 2016, the burger features Sriracha onion straws, zesty aioli, Cheddar cheese, spicy pickles, beef patty, lettuce, and tomato on a special-edition X-marked brioche bun (it originally came with a bun with three claw marks on top). Additionally, the chain is offering a free movie ticket to go see the new film when you purchase a limited edition $25 gift card.